Very lightly season the chicken thighs with salt and pepper and place them in the slow cooker. 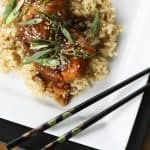 Whisk the honey, soy sauce, onion, ketchup, canola and sesame oils, ginger, garlic and pepper flakes together in a mixing bowl and pour over the chicken thighs. Cover the slow cooker and cook on low for 4 hours, or until the chicken is tender and cooked through. Use tongs or a slotted spoon to transfer the chicken to a rimmed plate or bowl and cover lightly with foil, leaving the pan juices in the slow cooker. Stir the cornstarch into the water with a fork or small whisk until dissolved. Whisk the mixture into the pan juices in the slow cooker. Re-cover the slow-cooker and turn the heat to high. Let it cook and thicken for 15 minutes. Carefully transfer the chicken back into the slow-cooker. Serve the pieces of chicken over the hot cooked rice, spoon the sauce over the chicken and garnish with sesame seeds and scallions.